Barbour Sporting Lightweight Tweed Shooting Jacket. The Barbour Tweed Shooting Jacket in 100% lambswool tweed is part of the Barbour Sporting range. An outdoor country clothing range for the active shooting sportsman. This is a premium range designed together with Lord James Percy, who is considered one of the best shots of his generation. Barbour Sporting includes; jackets, gilets, knitwear, shirts, cartridge bags and accessories. The Barbour Sporting Tweed was designed for the 2011 season. It is an exclusive, lightweight, 100% lambswool tweed, which is machine washable at 30 degrees, making this a very practical shooting jacket. There is a Gore-Tex protective lining sandwiched between the outer shell of the jacket and the inner lining and a waterproof inner hem to expel moisture. This jacket is waterproof, windproof and breathable. 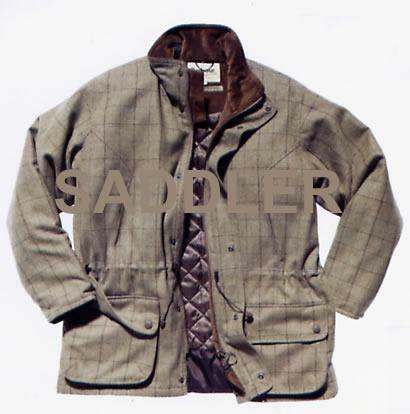 As you would expect from a Barbour tweed shooting jacket, the MWO0121GN52 has many practical features which make life easier and more comfortable for the wearer, these include; rubber stoppers on press studs to prevent scratching, reinforced neck and underarm ventilation, bellows pockets with retainer straps for easy access to shotgun cartridges and most importantly, diamond cut sleeves, for an unrestricted swing when mounting the gun. This Barbour shooting jacket is available in the Barbour Sporting Tweed only (as shown). Extra large only left. Length 33.5 inches.SALE!